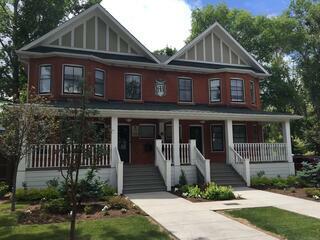 Our office, known as the Somerville Duplex, was built in 1911 during the expansion of the Canadian Pacific Railway. Constructed in the Tudor Revival style, the building is a rare example of a duplex style home from its era. It features bay windows and a full width veranda as well as a brick facade with wood framed and stucco roof gables. Originally, the duplex was home to William Somerville, a prominent businessman in the area. At that time, William Somerville was the owner of Somerville Memorials as well as Calgary Marble and Granite Works. The property was later owned by Abraham Belzberg, another prominent businessman who acquired the Calgary Brokerage Exchange that later became the Cristy’s Furniture Arcade. When we moved to the office, the home had seen better days. The masonry was crumbling, the roof was leaking, the windows were shattered and the basement furnace needed replacing. We decided to bring it back to its former glory and undertook several tasks to repair the home while still conserving its original architecture. Through a lot of hard work and collaboration with multiple stakeholders, the renovations were complete and we were able to bring the project to fruition, allowing us to become the recipients of our 2016 Lion Award!